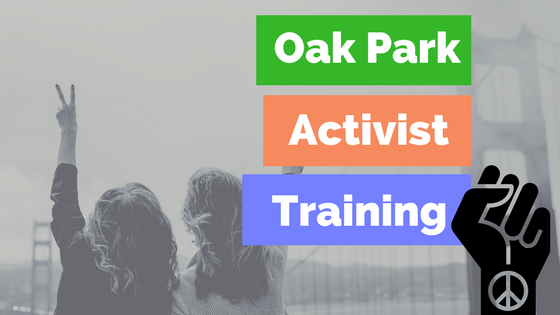 Joanna and I had the honor of attending the “Be Impactful” activist training hosted by Oak Park Progressive Women on Saturday, November 4. It was the kind of valuable, information-packed session that has you zinging around for days, riding a joyous I-can-be-impactful-after-all high. Mad props to OP Progressive Women for pulling off an incredibly powerful day. What’s that you say? You wish you could’ve been there? Never fear, intrepid activist! Read on. First, establish a good campaign goal—make it focused, make it realistic. Second, think strategy—how will you achieve this goal? Third, pick a target who will be responsive. Do some research to ensure that you are approaching someone like-minded. Decision-maker is with you Decision-maker gets to be the hero. Decision-maker will need “cover” to make an unpopular decision. Figure out how to make it in his/her self-interest to still support. Decision-maker is against you Decision-maker will need pressure (from you and constituents) to see your side. You can try to change the equation (think very long-term, e.g. electing someone new or changing public opinion) or move on to a new fight, which might be a more efficient use of time and energy. How do you find out what’s on the radar of legislative interest? During a session, find out what bills they are sponsoring. Look at the bill once introduced and see who else jumps on the bill with them. Try to meet with your MoC. Follow these steps. Know the issue you’re meeting about. You don’t have to be a super-expert but do your research. Know the MoC and their stance on the issue. You can still always find a way to relate to them during the convo (maybe about their family, about where they live, about their larger agenda, about their goals for being in public office, etc.). Find out how much time you will have with the MoC to plan accordingly. Prep your materials, keeping in mind that how you frame the issue will depend on who you are talking to. They may not agree with issues, so you might take an angle of fairness or of modernizing thinking, etc. Confirm your meeting appointment the day before and again the day of. While there, LISTEN AS MUCH AS YOU TALK. Be sure to follow up after the meeting! Develop a relationship with them or with who answers their phones. Try to arrange in-person meetings. Write a personal letter or email and, if possible, share personal story that’s relative to the law you’re discussing. State legislators can often help to plug you in to a like-minded advocacy group if you ask. is sent to the governor after passing both chambers of congress; governor has only so long to try to veto or to allow to become law. Get involved with them (such as with her group!) to let them guide you in how best to approach certain arguments and how to be most efficiently active. WAIT FOR AN ADVOCACY GROUP TO DIRECT YOU TO FILL ONE OUT. Why? If there are a few of them, those who filled out witness slips are read into the public record. If there are too many witness slips, they instead say something like “And we received 112 witness slips supporting the bill.” So advocacy groups may want fewer witness slips so that their names are entered into public record as supporting. When filling out, only put the list the name of a group you are in if you are specifically representing that group (not just as a member). Go here to watch (or at least listen, not all rooms have cameras yet) to everything in Springfield. The schedule is also up online here so you can see when a topic will be discussed.